This beautiful May weekend in 2016 is the USA Yoga National Championships in Jackson Hole, Wyoming. In fact, as I am writing parts of this post, I am watching the live streaming video of it. If the thought of “yoga” and “championship” in the same sentence makes you have an immediate reaction of disbelief, or perhaps even a judgmental freak-out, this post is written just for you. 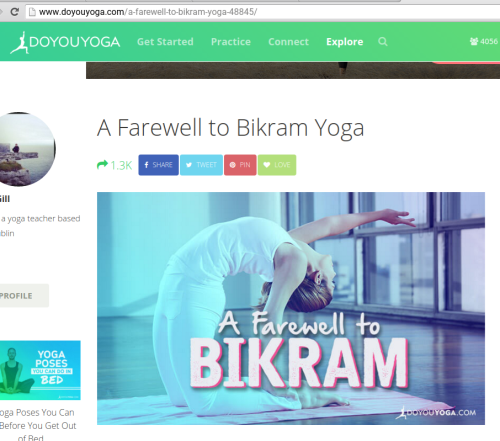 To back up for a minute, this blog series was started as an attempt to shine some light on the Ghosh lineage’s Bikram Yoga system by analyzing Liz Gill’s “A Farewell to BikramYoga” post from doyouyoga.com. I have been working my way through her article, point by point, and responding to it from a perspective from within the Ghosh-Bikram practice. Previously, I discussed her blanket claim that Bikram Yoga has no interest in diversity of bodies and ages. I showed how completely false and misleading that claim was, using just a tiny fraction of the (boatloads of!) available evidence from students and experienced teachers and school owners all over the world. Addressing all of this is proving to be pretty interesting. I hope that together we can improve education and openness. Ultimately I hope to to counter (or at least provide balance to) the gossip, judgments, and assumptions that are being perpetuated by Liz Gill’s article. And by many other individuals and blog posts around the world. So let us first discuss Ms. Gill’s perception of competition, her ideas about how Bikram Yoga is competitive, and her implied judgment that #ThisIsNotYoga. (I do promise to write an entire post on the insidious judgment and ignorance inherent in using that hashtag, don’t worry). And then we will return to the USA Yoga Championships themselves. “It can be difficult to answer whether one is happier or kinder, but you know if you can hold standing-head-to-knee pose longer than you did last month. This kind of competitiveness with oneself – and others – is at the heart of Bikram. (Yoga competition? I thought that was a contradiction in terms. Looking at you, International Yoga Asana Championships.) Some of the teachers’ instructions include commands such as “push, push, push” and “lock the knee!” – anathema to other traditions who emphasize gentle patience. I’ve heard Bikram teachers describe the practise as a 90-minute, eyes-open meditation, and maybe it can be that, but generally the emphasis is on going deeper, longer, harder, rather than stillness and connection. So we need to dissect this, one step at a time. But before that, please excuse this side note. We need to back up even further. Those who have practiced a prescribed hatha yoga sequence, over the course of many years, and on beyond-the-physical levels, can speak on behalf of this. But the masses of North Americans remain on the surface, at a fitness-only level of hatha yoga. In other venues I have termed it “yoga fitness”. And it is really not a terrible thing. It is certainly better than not doing anything at all, and it can help people transition into therapeutic hatha yoga if they encounter an experienced teacher. One of the most common reasons people do not stick with a repeated class or sequence. Many North American practitioners and teachers make their classes “fun” by adding trendy playlists. Or they add new and different postures in order to bring “interest” or entertainment to their classes, or an “advanced” label to their yoga practice. Some get “bored” with a sequence that doesn’t change, because they are more focused on the posture itself rather than on the uniqueness and differences that occur in the body, mind, and energies every single day. The ironic thing is that these subtle and miraculous differences can best be noticed when the sequence is a prescribed and consistent one over the course of several years. In hatha yoga – Bikram-Ghosh lineage or otherwise – the postures are tools that we use to understand more about what is going on with us and to bring balance to the system. The postures are not the end goals in themselves. Personally, although I practice the 26-and-2 Bikram method class as my core foundation, I enjoy expanding beyond the prescribed postures of Bikram’s Beginning Yoga Class on a regular basis. I have been practicing other Ghosh lineage sequences quite a bit lately in preparation for a Ghosh Practice Week this summer in Madison. I took and thoroughly enjoyed a Yin Yoga class a few weeks ago. And I have benefited from the Five Tibetans, Iyengar classes, and the Ashtanga Primary Series at various times in the past decade. If I had the inclination or desire to go to any number of the yoga fitness studios in my area, I am sure I could find some enjoyment there. But a consistent and comprehensive base as a beginner is an absolute requirement in my opinion. And they have all but disappeared in the yoga world today! Even at “Ashtanga-based” studios, it is hard to find more than one Ashtanga Primary Series class per week. (Another practice that has retained the stillness and disciplined nature of hatha yoga.) At least in the capital area of the fine mitten state. I cannot speak for more major metropolitan areas or the East and West coasts…. To look at the idea of prescription and consistency in a broader yogic way: have you ever been initiated into a kriya yoga practice? If you want to talk about what yoga is and is not, kriyas are probably the closest thing to “traditional yoga” (loaded term, I know) that we have access to today. They are prescribed techniques that must be done very exactly, usually twice per day, without any alteration, addition, or subtraction, Their goal is to bring the intersecting energies of the body, mind, emotions, and energies into balance. They were transmitted by Paramahansa Yogananda, and are still shared by Shibendu Lahiri (Mahasaya’s greatgrandson), and Sadhguru Jaggi Vasudev, among others. These kriyas are practiced daily by millions of people around the world. They are never changed at whim or by someone who has been practicing or teaching them for a few years. They have very specific effects on the many layers of the human being. Bikram Yoga, when you get right down to it, begins to function as a kriya. At least in my experience. The energies do change. The mind most certainly changes, and very quickly at that. The emotions transform into awareness and non-reactivity. And as I now have seen over 4000 bodies attempt this practice over more than a decade, I feel that I have only just begun to witness the brilliance of Bishnu Ghosh’s therapeutic yoga systems. Ok, that aside is over. Back to Ms. Gill’s implied argument that the repetitiveness leads us into a competitive or comparative mindset regarding our physical abilities. My immediate response is that we bring those competitive mindsets with us as conditioned human thought patterns. It strikes me, over and over, how frequently people blame the yoga for their pain or their emotional reactivity. The yoga is just the light, shining brightly on the old injuries, showing us the emotional or energetic tendencies that have already been built up to a near-boiling point. Bikram Yoga does not take an otherwise completely chilled out, meditative person, and make him or her lose their peace. And if a posture triggers something that makes you want to cry, just cry. I can almost guarantee that every Bikram Yoga teacher has done it at some point. Better than holding it in. The release was obviously necessary, and if you look at the 90 minutes as a healing process, you will be glad you got the opportunity to cry. But if you look at it as a competition or performance, you will categorize Bikram Yoga as impossibly difficult. Yet for all this emotional healing potential, Ms. Gill dismisses the entire process and says it is “difficult to answer whether we are happier or kinder”. This statement truly makes me wonder if she has ever really practiced Bikram Yoga!! Even more quickly than our ability to balance improves, with Bikram Yoga we do become not only happier and kinder, but more relaxed, more observant of our thoughts, more understanding, more compassionate, more joyful, and more peaceful. These effects are not only measurable and noticeable, they are dramatic. As you probably understand by now, I do not experience or teach the essence of the Bikram Yoga practice as having anything to do with how long you can or cannot balance in Standing Head to Knee. Or forcing anything at all. I do realize, though, that when most people begin practicing yoga – and often for quite a while -, the human mind operates in a competitive way. People BRING competitiveness into the room with them. And then they call the yoga competitive. Much of my job as a teacher is to point out this tendency and to help people make that shift within themselves. Every day I get to use a brilliantly-designed and comprehensive hatha yoga system as an effective tool to lead people into health and wellness. In doing so, they not only balance their biochemistry and physical health, but they transform into more present, more connected, human beings. On a near-daily basis, I remind my students that locking the knee is only 1% about the technique of contracting specific muscles (all the while teaching them the exactly correct technique, of course!). Locking the Knee is 99% about concentration and this stillness. Now, after several years, on most days, you WILL be able to hold Standing Head to Knee posture longer than you did during your first year or two of practice. But this ability is merely a reflection of the steadiness of your concentration, the stillness of your energies, the cessation of fluctuation of the thought waves of the mind. It is a reflection of the fact that you have cultivated these internal, mental qualities, day after day, year after year. Without an eye on the prize or a need to achieve. Because if you stay focused on the achievement need, you will either drive yourself crazy, or stop after a month (or a year or two) and make a list of excuses as to why you simply cannot do Bikram Yoga. Why it is not for you. And worst of all, why other people should not do it. When you are locking the leg or holding any other kind of controlled stillness in hatha yoga asana, you are so fully and completely involved in what you are doing, there is absolutely no room for thinking about your accomplishment on a previous day. No energy directed to thinking about how long the person next to you is balancing. No wishing or fantasizing about how much better you will become in the future. This total involvement is an important part of the fierceness and determination we observe and practice in Bikram Yoga, and unfortunately it is interpreted by some as “grasping”. But they are not the same. Without fierceness and determination, we will let our experience be consumed by the past and the future and comparison and frustration and drama and anxiety…and all the other complete b.s. the mind creates. So maybe the command to “push” the hips to the right more, or the demand to “go back, way back, more back, fall back” pushes your buttons. Maybe, because of a few of these words, you perceive the entire 90 minute practice as non-meditative. Or non-yogic, or evil. Or whatever label you need to apply to it to feel justified in not participating in the practice. Maybe someone, somewhere, had a Bikram Yoga teacher who really had not experienced the meditative side, or who could not communicate it very well. We are all different, and this is a possibility. But if and when you practice sincerely and regularly, and when you remain open to learning from your teachers, you realize that these “commands” are ultimately not a teacher telling you what to do. The words become the directives we send within our own bodies. The commands create one half of a most incredible, intelligent, and highly functioning communication system that travels to and from each part of our human systems. Besides healing the knee joint and helping the sciatic nerve, locking the leg teaches us to choose to have no choice but to focus on the task at hand. Pure, total, involved action. No grasping and certainly no ambition to perform. Now, I can understand how a surface practice – or a mind which has been conditioned in a competitive culture – could lead some to judge the practice negatively, and to initially have a judgmental reaction to the International Yoga Championship. Perfectly reasonable. And this is exactly how I have experienced these types of events. Several years ago, I participated in the Michigan Yoga Expo on two separate occasions, both times at Bikram Yoga Ann Arbor. These functioned as “qualifying” events for the National Yoga Asana Championship, whereby one or two men and one or two women from Michigan would go on to the next level. I cannot begin to express in words how supportive and accepting and loving this entire day was. “Competitive” would not even be on the list of words I would use to describe it. Several of us warmed up together, helped each other with techniques here and there, laughed quite a lot, and hugged each other constantly. The “stage” and some chairs were set up. While each of us practiced our 3-minute routines in front of the audience and judges, the rest of us sat there (some of us with a bit of nerves for each other). We each hoped that every single “competitor” could conjure up their best concentration, peace, humility, strength, and relaxation for their routine. No one wanted to “beat” or “outperform” anyone. At least not that I could tell. This was one of my required postures (at that time there were 5 required postures and 2 chosen postures). It is nothing fancy, nothing terrible. It is nothing at all, in fact, other than a learning opportunity for myself and a community experience. And perhaps even a chance to inspire others to start a practice or to dedicate themselves at the next level. Even within the short three minutes of my routine, I noticed where my weaknesses were. I noticed when my nerves came up, when my breathing was not as calm as it could be. With total acceptance, I watched myself. I watched others who had more calmness and steadiness than I had at that time. And I was more than happy that they were “judged” to go on to the next level. If I aspired to anything, it was to create more calm in my practice, more humility in my approach. Call it “grasping” if you will, but it felt like an overwhelming wave of appreciation and love. I left feeling inspired and grateful. If you believe that these asana competitions are inherently “unyogic”, I invite you to attend one. Or, for that matter, train for and participate in one. Watch this beautiful video of Michael Fine in a recent regional event. As his friend describes it, it is “2 minutes and 50 seconds of pure inspiration”. Read Jared McCann’s Interview for his take on the the depth and healing potential in yoga asana practice and training. I can’t say that 100% of participants feel this way, but there are certainly some common threads here. Tremendously therapeutic and transformational stuff going on. Wouldn’t we like to share these sorts of examples to our children? As an alternative to the body-destroying contact sports that are on every large-screen TV out there? This is the greater mission of USA Yoga and always has been. So instead of instantly rolling our eyes at the idea of “yoga” plus “competition”, we can be open to inquiry. How inspirational can the championship be? Can it be healing? What about life-altering for the better? And to answer these questions, we have to first of all be open to the questions and possibilities in the first place. Open to the experience of something we might not really understand at first encounter. And most of all we must be open to the likelihood that when we have a reaction or a judgment to something or label it as “not yogic” (even if we do not come out and say it), we are bringing that label with us. It is not inherently there. 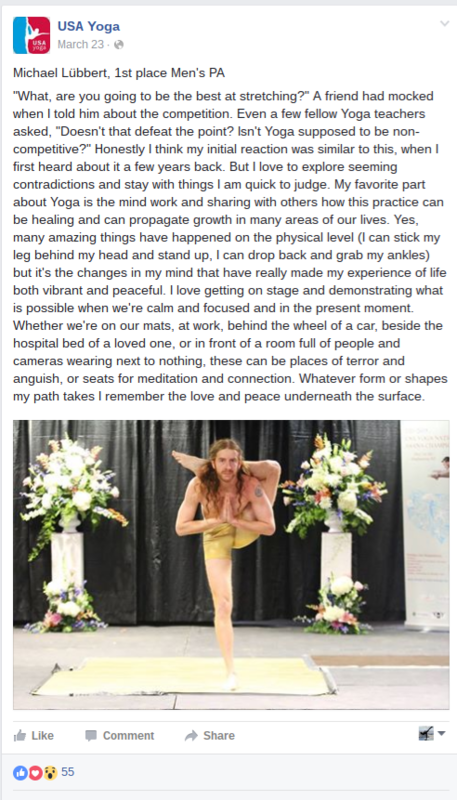 A yoga competition is not always a competition. It is my wish and intent that we collectively increase our intelligence, and collectively stop feeding the drama machines. About everything, not just our yoga practices. Yoga bloggers, magazine publishers, and media outlets of all kinds: let’s do it. And in the meantime, I will see you in class!! © 2019 Bikram Yoga. All Rights Reserved. 5 days for $5 – March Madness!